Rice is the cornerstone of the Khmer diet and widespread production puts Cambodia among the top rice growing countries in the world. It was the end of the rainy season when I recently visited. In the countryside, knee high rice crops in flooded paddies formed a lush and verdant landscape. The grain heads drooped on their stalks as they fattened and turned to golden ripeness. In some areas where the paddy water had receded, farmers were bent low over their crop cutting the precious stems with a sickle. Each armful was added to a stook waiting to be loaded onto a bullock cart and taken to be threshed and dried. We saw roadside verges carpeted with rice grains still in their husks, thinly spread on plastic sheets, drying in the sun. Once dried the rice would be winnowed, then stored. The Cambodian rice that I ate was plump and medium grained with a pleasant firm texture. Khmer women, even in the most rudimentary of kitchens I observed, cooked their rice by the absorption method. Rice is a valuable crop for many reasons. Even the poorest subsistence farmer will grow rice. The grains will feed his family, the stems are fodder for his cattle and the husks are a hot burning fuel. A valuable byproduct of the rice paddy is the rats, snakes and insects that are harvested as protein sources and the morning glory greens that grow wild on the perimeter that are cooked and eaten as a vegetable. Every menu I perused, every meal I ate while in Cambodia included rice in some form. Breakfast every day was rice noodle soup, rice porridge or fried rice. Fresh rice paper rolls stuffed with rice vermicelli noodles, herbs and pork or fried rice paper rolls with vegetables were common snacks and starters. Only salad dishes were served without rice as an accompaniment, but every hot meal was served with a bowl of simple steamed rice. Dessert was delicious sweet tropical fruit usually accompanied by rice, this time sweet glutinous rice with palm sugar and coconut. But rice is also a tradeable commodity. Around the town of Battambang, we visited cottage industries value adding to their rice crop. 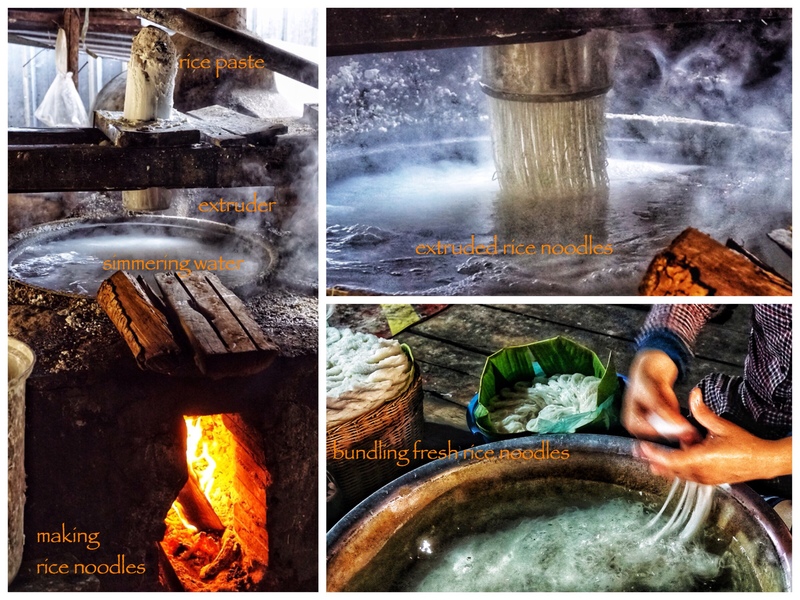 Rice noodles, rice paper wrappers and “medicinal” rice wine are produced in small quantities by labour intensive traditional methods and sold at the local market. There was no gleaming stainless steel vats manned by workers in protective clothing and hair nets. These products were manufactured in open sided wooden structures with palm leaf roofs and dirt floors using basic equipment over fire. The noodles were made from a stiff paste of well soaked rice, ground by stone, then extruded into a vat of simmering water to cook. The wrapper formula was similar but the paste was mixed into a slurry by adding water. A circle of rice paste was spread by hand onto a hot, cloth covered plate. It was briefly steamed then adeptly lifted into a rattan rack and set aside to dry. Rice wine infused with herbs, flowers and barks is said to have medicinal properties. It is given to new mothers post partum to help restore their strength. The Khmer men drink rice wine infused with spiders and snakes believing it will enhance virility. Rice plays an integral part of daily life in Cambodia. Which ever way you look at it, rice is the sustainer of Khmer life. Cambodia, I think, would be a fantastic journey. You’ve captured the spirit of their rice culture and taught a bit about rice while at it. I for one would certainly welcome more on Cambodia and your fascinating journey. Rice, rice and more rice just about sums me up 🙂 ! Tho’ almost always brown or black. Loved your photos and the tales which came along. I know the local methods of cultivation are primitive and the work so hard but somehow, compared to many ‘modern’ ways of cropping and preparing, per chance there is more satisfaction and contentment in thus tilling the land . . . have not had water rats but why should they be any different once cooked than say frogs or snails which are such favourites in France and the rest of Europe 🙂 ! Hands on small lot farming practices fitting into the rythmn of the season seems a far more enlightened way, and no chemicals needed, which makes it so much better. Cambodia’s northern neighbours have funded hydro electric schemes on the rivers that are essential to agriculture. The river water is being held back all year except during the monsoon so at least there is no threat to the rice crop and the fertility of the land. Lovely informative post, LRS. I didn’t get bored with the rice either. I wonder if there is an export market for Cambodian rice. Must check. One million tonnes was the target for 2015. That’s a lot of rice. Thanks Al, writing about our time there is keeping the memories fresh. Have finally gone through the photos, much more to write about…..
….rats, snakes and insects harvested as protein sources – how resourceful these people are! Great, look forward to a chat or three! Your two posts on Cambodia brought back fond memories of our travels there in 2005. 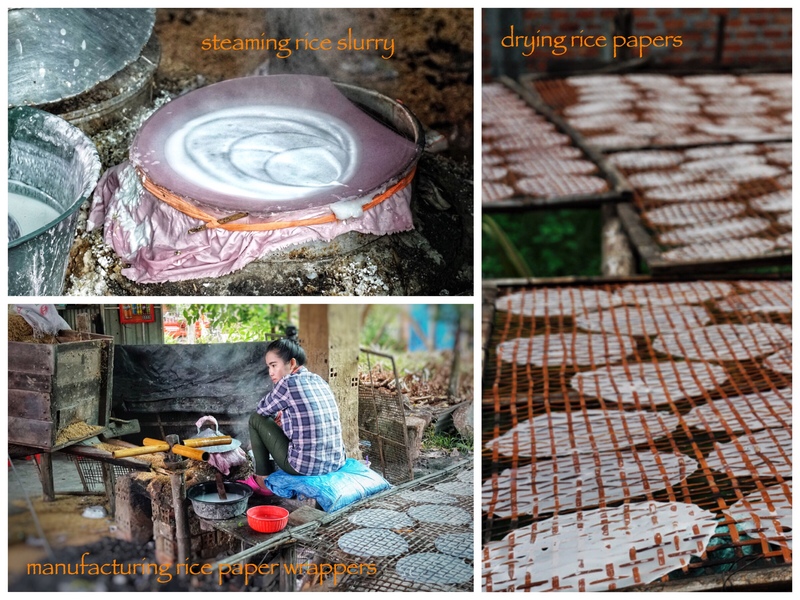 Especially the photos of rice noodle sheets drying and the rustic manufacturing techniques still used in rice wine, which are also still used in the countryside of Bsli and Thailand. I hope to see more of your journey too. Cambodia in 05 must have been tough. We found the gentle hard working people were still suffering from the ravages of the brutal regime. I lost count of the number of times we commented about our zealous OH&S. Yes definitely more to come…. It was, especially Phnom Penh, the Russian and central markets, the poverty, the land mine victims. Still, beautiful though. This entry was posted on November 22, 2018 by ladyredspecs in Cooking, Food, travel and tagged cambodia, cottage industries, food, khmer food, rice, Travel.